A new choice of shoes and boots for protection against electric shock. 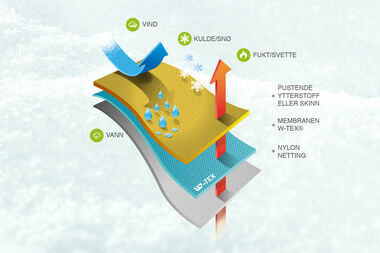 Voltmaster is a new range of protective footwear with improved properties. They are electrically insulating all the way up to 18,000 V and have a sole with improved comfort and safety. These are welcome improvements that make them especially suitable for electricians, electrical fitters, energy fitters, and power line workers. Most protective footwear conducts electricity. That is, they conduct the current to earth in order to prevent static electricity from building up in the body and causing unpleasant shocks or destroying measuring instruments. 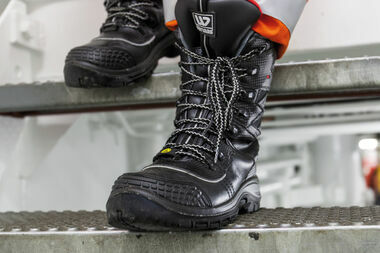 Voltmaster protective footwear has been developed to handle personal protection requirements – and reduce risk. As well as insulating up to 18,000 V, Voltmaster protective footwear also gives extra comfort and grip throughout the year. The Voltmaster range has three layers of shock-absorbing soles. The shock-absorbing outer sole is made of rubber, with very good grip when moving forwards, backwards, and sideways. 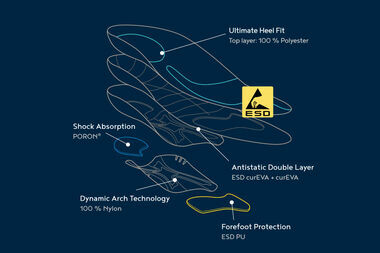 In addition to a PU midsole, Voltmaster has an inner sole that also absorbs shock – and which can be taken out if needed. The shoes have a lightweight and metal-free composite toecap and are puncture resistant . The Voltmaster range consists of four models – low shoes, ankle boots, lined winter boots, and lace-up boots. The low shoes come in both fabric and leather, while the ankle and winter boots are made of W-Tex membrane – which breathes and helps keep your feet warm and dry. All models have ATOP lacing and a modern and uniform design with fluorescent and highly contrasting colours.